Palma Airport is located just 8kms east of the city of Palma de Mallorca and is the 3rd busiest Airport in Spain and for a brief period over the busy summer months actually becomes the busiest airport in Spain. To make your travel to and through Palma Airport easier we have put together what we believe is the best guide to all flights, services and information on Majorca Airport that is available today. Palma Airport Car Hire is both cheap and easy to book at Palma Airport and we have some brief Palma Airport driving directions and a couple of Palma Airport maps to help you on your way. Palma de Mallorca Airport is one of the airports with the highest volume of passenger traffic in Spain, especially concerning international traffic. On a national level, it is among the three airports with the highest annual volume of passenger traffic and reaches first place for international passengers in the summer when the Majorca weather is at its best. 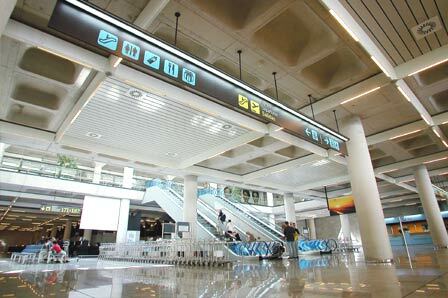 At a European level, Aeropuerto de Mallorca is situated among the top twenty airports. 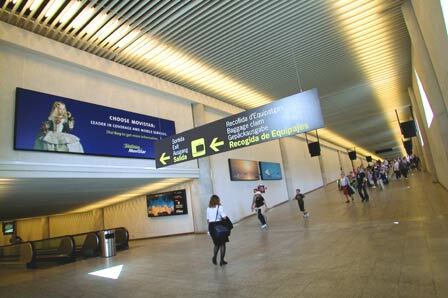 Palma airport facilities are made up of various interconnected buildings for passenger handling. These buildings are integrated into the main terminal, which is divided into six floors and where all airport activity is handled. There are four boarding modules (A, B, C and D). Palma Airport ended 2004 with a total of 20,416,321 passengers. As regards nationalities, Germany is the country with most passenger traffic, followed by Spain and Great Britain. The Government’s interest in developing airmail led it, towards the end of the first decade of the 20th century, to study the possibility of establishing a postal airline in the Balearic Islands. Finally, in 1921, the Aeromarítima Mallorquina company was awarded the Barcelona-Palma postal line, using seaplanes for the service which landed in the port of Palma. Before the line was opened, test flights had been carried out in the fields of Son Sant Joan and Son Bonet, where a private aerodrome was finally set up. In 1934, the company Aero-Taxi de Mallorca was created to organise tourist flights to Majorca. The company opened a flight school, using the existing aerodrome in Son Sant Joan for its flights. A year later, it opened a flight school at the Son Bonet aerodrome. In May 1935, the LAPE (Líneas Aéreas Postales Españolas) company, the predecessor of Iberia, was established. Some months later, in August, the first scheduled service began between Palma and Madrid, with a stopover in Valencia, using Son Sant Joan airport. A year later, this line was replaced by the Palma - Barcelona route. Three years later, Lufthansa and Iberia established new routes based at the Son Bonet aerodrome, as Son Sant Joan was being used for military aviation. In 1954, while Son Sant Joan was still a military air station (and Son Bonet was the airport used for commercial traffic), its runway was extended and asphalted to allow the operations of the Sabre F-86 jets, which required first diverting the Palma - Llucmajor motorway. The aircraft parking apron and the parallel taxiway were built at that time. The work was carried out at the same time as the arrival of the first large groups of European tourists to Son Bonet, on BEA, Air France and Aviaco airlines. The increase in traffic and the impossibility of enlarging the airport at San Bonet led the drafters of the 1958 National Airport Plan to propose the construction of a large commercial airport at the Son Sant Joan air station. The National Airport Board approved this work as part of the national investment programme and, by ministerial order of 29 July 1959, authorised transfer of commercial traffic from Son Bonet to Son Sant Joan. In 1958, a VOR was set up on the island as well as a VHF communications centre at Son Sant Joan itself, coinciding with the publication of the Son Bonet aeronautical limitations. A provisional passenger terminal was built for commercial traffic at Son Sant Joan, as well as an aircraft parking apron, separate from the military apron. An order dated 7 July 1960 opened the Son Sant Joan airport to domestic and international traffic, classifying the airport as an administrative category one. Just two weeks after opening to traffic, on 21 July, expansion of the aerodrome was declared to be in the public interest and a matter of urgency. Work on the runway extension began in the summer of 1961, together with a parallel taxiway. At the end of that year and the beginning of the next, work on the power plant, the communications centre and the fire and rescue facilities began. The 1964-1967 Airport Plan focused especially on the airport in Palma, which in 1962 was serving over a million passengers each year. The project, with a budget of close to five hundred million pesetas, included a runway extension, an apron enlargement to make it possible to service 28 medium size aircraft, a terminal for over five million passengers as well as all the complementary works and runway lighting, communications, and navigational aid facilities. In the summer of 1965, work began on the new passenger terminal (Terminal A) and, at the end of the following year, the air navigation services were improved with the installation of surveillance radar. The exceptional growth in traffic, which had already exceeded two million passengers a year by 1965, made it necessary to build a new terminal to accommodate non-scheduled flights, and studies began on the construction of a second runway, parallel to the existing one. Work began on this second runway in late 1970, and, at the beginning of the following year, on the modular station for non-scheduled traffic, as well as a new aircraft parking area opposite the terminal. The work was completed in 1972, when Terminal B went into service. Work on the second runway continued over the next two years, as it was extended and the tarmac strengthened to support aircraft of up to 450 tons. Throughout the 1980s, the increase in passenger traffic in Palma de Mallorca was constant. The number of passengers increased from slightly more than seven million in 1980 to nearly 10 million in 1986, exceeding 15 million in 1995. This permanent growth again posed the need for a profound restructuring of the airport’s terminal area. The required work on the new Son Sant Joan airport complex began in mid-1993, with a planned investment of over 40 billion pesetas in the following three years. Works included the extension of the aircraft apron, the sanitation and drinking water network and, especially, the new terminal. 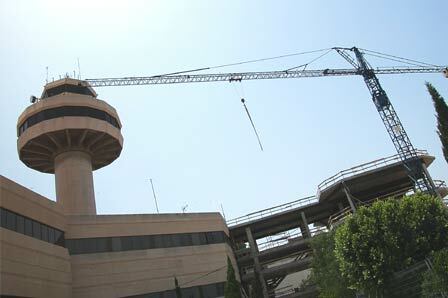 The new terminal, opened in 1997, was designed by the Majorcan architect Pere Nicolau Bonet. Departures, on the upper floor where the pre-boarding lounges are located, is accessed from the check-in lobby. The airline companies have their offices on the upper floor, whilst the arrivals area is on the ground floor of the building. 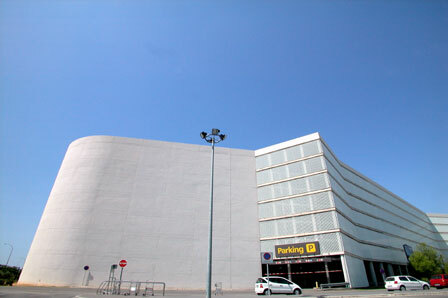 In front of the passenger terminal there is a large building for car parks. In April 2003, the building for boarding inter-island flights was opened, specially designed for passengers on regional or short-distance flights. The building comprises two roofed sections joined by a section of skylights located over a huge lobby. The ground floor is dedicated to the passenger boarding area. The upper floor, a balcony-observation deck that overlooks the lobby, is accessed from the main terminal check-in area through the airbridge that joins both buildings. The upper floor has a spacious cafeteria in the pre-boarding waiting area, and on the ground floor there is a commercial area as well as the airline offices. A General Aviation building has also been built. The new building has all the necessary services for private flight companies and passengers, freight aircraft and aero-taxis. These latest airport infrastructure activities in Palma have permitted Son Sant Joan to enter the 21st century as one of the world's most modern airports with a proven capacity to serve over 20 million passengers. AENA accepts no responsibility for the information posted at this site neither for the possible damages caused for the use of this information. OPS Coord apn svc, provides info on slots and FPL, mnt arr and dep at Son Bonet arpt. CAUTION Apn WIP til 31 Mar 06 est. LGT PAPI Rwy 06R GS 3.4 . MISC Mil OPS duty desk C034 971 49 7566. The content above was published at Airports-Worldwide.com in 2006.